This historical sketch was originally prepared as an illustrated lecture for a departmental colloquium given on November 7, 1975. In seeking a short and lively title for the colloquium, I chose one that may seem pretentious. The emphasis here is on the Department of Botany. The title chosen was not meant to minimize in any way the excellent work in plant science that has been done elsewhere on the campus particularly in departments of the then College of Agriculture, now College of Natural Resources. This topic is left to better qualified biographers. It is manifestly impossible for me to mention all persons who have contributed to or who are now contributing to the distinction of the Department of Botany. I have, therefore, tended to represent the faculty exhaustively and other staff members highly selectively. This sketch is dedicated to the memory of Leonard Machlis (1915-1976), who conceived and encouraged the project throughout, and to that of Lee Bonar (1891-1977), who did most of the research on the earlier period in connection with the University of California Centennial. I wish to thank the following persons for their invaluable assistance: Dr. Marion Cave and her departmental picture gallery; Mr. James Kantor, University Archivist, and his archives; Mr. Richard Hafner, of the Public Affairs Office, and his “morgue”; and Mrs. Alice Howard and Miss Alta Pray for typing, editing, correcting, and providing many other forms of help. Finally, I am most appreciative of the decision of Chancellor Albert H. Bowker, at the request of Chairman Machlis and with the endorsement of Provost Park, to make possible the printing of this history. The University of California had its beginnings in the private College of California, which was incorporated in Oakland in 1855, only six years after the Gold Rush, and which opened in 1860. Tuition was $40 per year, and other expenses, including room and board, were estimated at about $200 annually. The Reverend F. D. Hodgson was named Instructor in Mathematics and Natural History for 1861-63, but what he taught is problematical. William H. Brewer, the principal botanist of the California State Geological Survey, was named Professor of Natural Science in 1863 and he did give a course in chemistry later that year, but he left shortly thereafter to accept the position of Professor of Agricultural Geology at Yale. 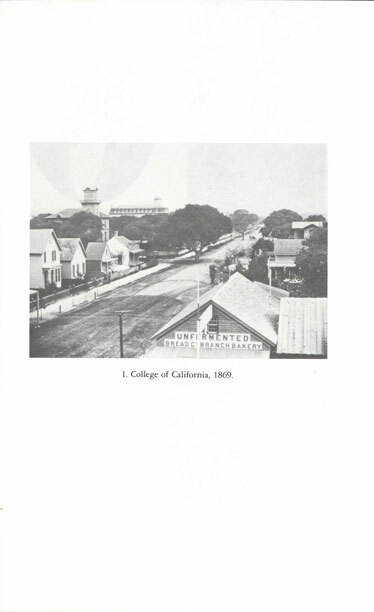 The year 1868 marked the actual establishment of the University of California by the merger of the College of California with a proposed State Agricultural, Mining, and Mechanical Arts College, which had been authorized by the State Legislature two years earlier. Classes continued to meet on the Oakland campus while the site for the University was being readied in Berkeley. The first undoubted botanical instructor to grace the new institution was Joseph LeConte, M.D., who appears as Professor of Geology, Natural History and Botany in the roster for 1869-70. He was a Southerner who first practiced medicine, then took a Harvard degree in geology under Louis Agassiz, and subsequently taught at Oglethorpe, Franklin College, and Southern Carolina College before embarking upon his notable career in California. LeConte announced on his arrival: “The course of lectures in this Department [i.e., geology and natural history] will commence in this class with Botany. In this first term Structural Botany is taken up, and in the second term the Physiology of Vegetable Growth and Reproduction, and the principles of classification of plants. The course is fully illustrated by the use of the microscope. 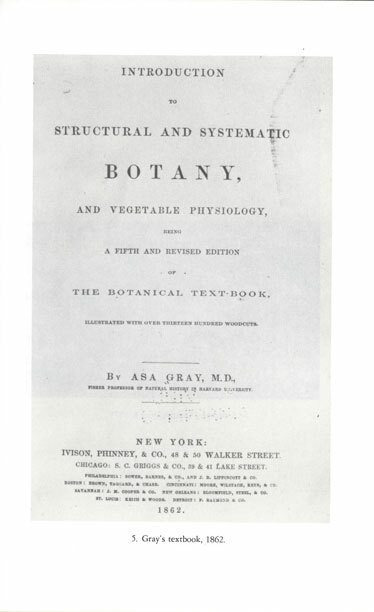 Text Book: Gray’s Structural and Systematic Botany.” Originally the botany class met for one two-hour session weekly for one term, but by 1874-75 the course had become a two-semester offering. President Daniel Coit Gilman pleaded in his report for 1872-73 for “a professor whose province it is to teach the Laws of Vegetation—all that pertains to the growth and structure of plants, or Botany; in its scientific and economic aspects; and there should also be a competent gardener, and perhaps a forester employed at once to take charge of the grounds. 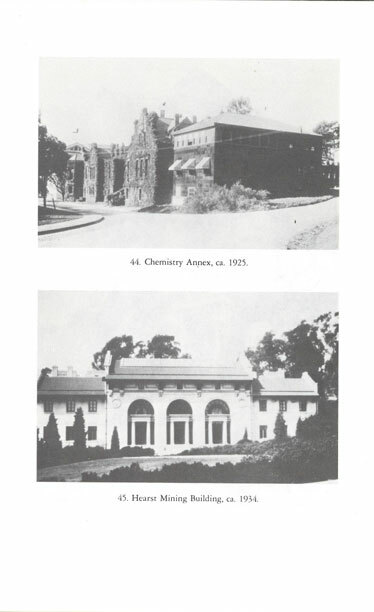 . . .” His report also included a letter from Asa Gray urging establishment of an arboretum to parallel the Arnold Arboretum then being organized in Massachusetts by Charles Sargent. Meanwhile, across the bay in San Francisco, the California College of Pharmacy was founded in 1872 with Hans H. Behr as Professor of Botany. 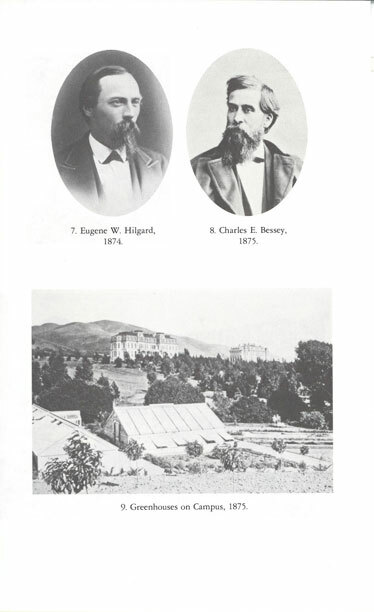 The College of Pharmacy became affiliated with the University the following year, but Behr, a German-born physician and political emigré, did not come to the East Bay, although the Regents made him Emeritus Professor of Botany in 1894. The total enrollment in the entire University at that time was 228. Nevertheless, in that same year the College offered lectures on Economic Botany and Improvement of Varieties in Plants and Animals by Charles E. Bessey (a visiting Lecturer from Iowa Agricultural College), on Forestry by Henry N. Bolander, on Field Botany by Walter P. Gibbons and Alexander Kellogg, and on Lower Forms of Vegetable Life by H. W. Harkness. 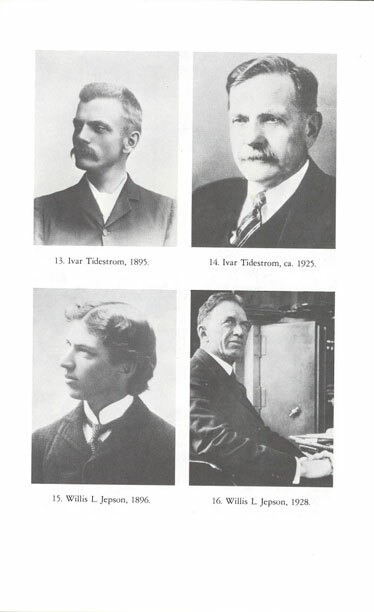 All four of the last gentlemen were associated with the California Academy of Sciences in San Francisco. Bessey recalled that he was paid $300 for the month’s lectures plus travel and other expenses, which he thought to be very generous recompense. He and Mrs. Bessey were met in Omaha by President Gilman (who was just returning from an interview that led to his accepting the presidency of Johns Hopkins), and they journeyed together to California by train. Some of Bessey’s recollections of his Berkeley experience, as described in a letter he wrote in 1911, may be illuminating. Arriving at Oakland we were advised that it would be best for us to find quarters in town rather than to attempt to do so in Berkeley, then only a much scattered village of but a few people. A horse car ran towards Berkeley at long intervals, and a couple of miles out in the country it stopped in a discouraged sort of way, and the passengers were obligated to wait on an open platform for a smaller car drawn by a single mule at a very slow pace. In time, however, the car brought one to the edge of the University grounds, at that time marked by a brook and a fine California Laurel tree. We crossed the brook on a plank, and walked a little distance to the two buildings which housed the University of that day. I think it took a full hour to make the trip from Oakland to Berkeley. How far the distance actually is between the two places I have never learned, but at that time it seemed to be many miles. . . . The first course of lectures was begun on the 14th of January, and continued for three weeks. While labeled “Economic Botany” it was actually a pretty fair presentation of a very considerable portion of the vegetable kingdom after the modern fashion, running from lower to higher plants. . . . The treatment was primarily structural, but to this were added pathological discussions which were really not bad for that time, when the term “plant pathology” was as yet scarcely ever heard in botanical lectures anywhere in the country. . . . The second course of lectures was devoted to the principles of Plant Breeding, a subject which was then very new in every part of the United States. . . . This second course was completed February 16. It is important that a separate department of general and economic Botany should be formed, and that a Professor of Botany should be appointed at a salary of $3,000 a year. He will require an assistant for the purpose of taking charge of the herbarium and aiding in instruction of the classes at $600 a year. The formation of a large herbarium should be seriously begun. The annual expenses will be $200 a year. The cost of the department of Botany then should be $4,100 per year. The first strictly botanical appointee in the history of the University of California and hence the actual founder of the Department, was Edward L. Greene, appointed Instructor in Botany in 1885. He was a Rhode Island-born and Wisconsin-educated Episcopalian clergyman. When he was stationed in Yreka in 1872, he was sending plant specimens obtained in his vigorous field work to Asa Gray at Harvard. A decade later he was established in Berkeley as Rector of St. Mark’s and had made connections with the California Academy of Sciences. Prior to his appointment he had taught an occasional course at the University for a stipend of $900 per annum. By 1890 a College of Natural Sciences had been established to provide a course of study leading to the B.S. degree “to meet the wants of students not caring for the courses in the colleges of applied science.” The Department of Botany was established under the new College in the same year. 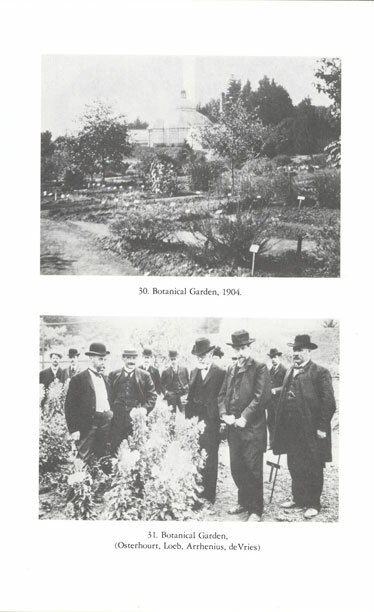 An early start had been made on a botanical garden with the employment of a student named Ivar Tidestrom; a herbarium had been initiated as a unit of the Department’s activities; and a spring garden of native plants had been designed by Assistant Willis Linn Jepson. In 1891-92 Professor Greene taught Systematic, Economic, and Medical Botany (five terms in all), assisted by Instructor Marshall Avery Howe, who taught Vegetal Structure and Morphology and Cryptogamic Botany. Joseph Burtt-Davy, an Englishman, began a ten-year association with the Department the following year, teaching Economic and Commercial Botany and serving in the Experiment Station, before going on to a distinguished career in South Africa and the Imperial Forestry Institute at Oxford. This founding era ended when Greene resigned in 1895 to become Professor of Botany at the Catholic University of America. From 1904 until his death in 1915, he was an associate in the Smithsonian Institution. (There is speculation that he visualized himself as a likely candidate to fill the immense gap created in American botany by the death of Asa Gray.) As was the custom of the day, when he left California, Greene took his excellent herbarium with him. The Washington plans seem not to have gone well, and his herbarium went on to Notre Dame, as did he, but he died soon afterwards. The Greene Herbarium, rich in California types, is still at Notre Dame where it now has the distinction of being the first herbarium to be completely computerized. Following Greene’s departure there was a flurry of worry and intrigue among the junior staff members, sparked by the efforts of Dean Hilgard to move Botany back into the College of Agriculture. Departmental autonomy was assured, however, by the appointment of William Albert Setchell of Yale and Harvard, then 31 years old, as Professor and Chairman, the combined position he held until his retirement in 1934. It was Setchell, with his pioneering systematic studies of marine algae and his broad interest in the dynamics of plant evolution and phytogeography, who established the Herbarium and the Botanical Garden officially, and who set the Department on its way to achieving international distinction. The Department soon had two instructors, when Jepson was promoted from assistant. W. J. V. Osterhout replaced Howe as the other instructor, when Howe left for graduate work at Columbia University and a successful subsequent career at the New York Botanical Garden. 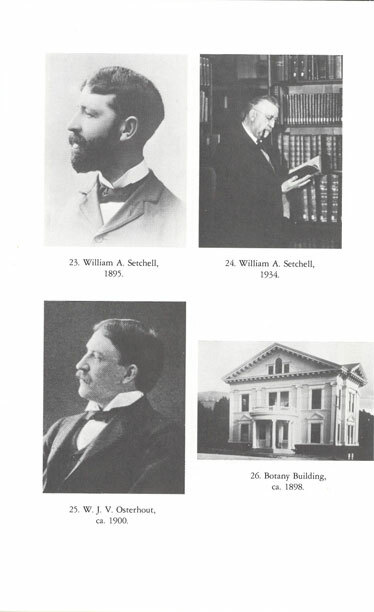 With the staff thus expanded, it was now possible to offer some sixteen semesters of botany, with Setchell giving his always popular introductory course as well as cryptogamic botany; Jepson taught systematic botany; Osterhout, physiology, histology, and cytology; and Burtt-Davy, economic botany. Setchell, Jepson, and Osterhout collaborated to give a “Botanical Seminary,” and each offered advanced work for graduates in his own specialty. 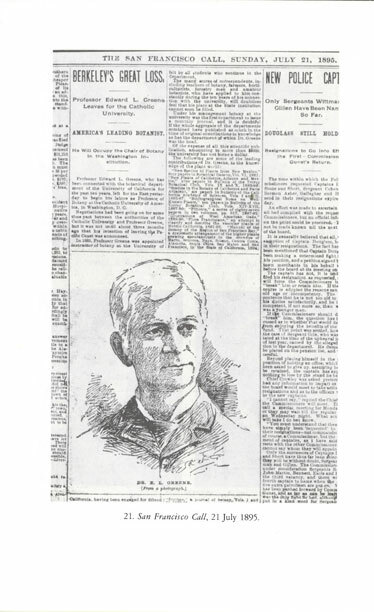 In 1898 Jepson was awarded the tenth Ph.D. degree to be given by the University and was promptly promoted to Assistant Professor. 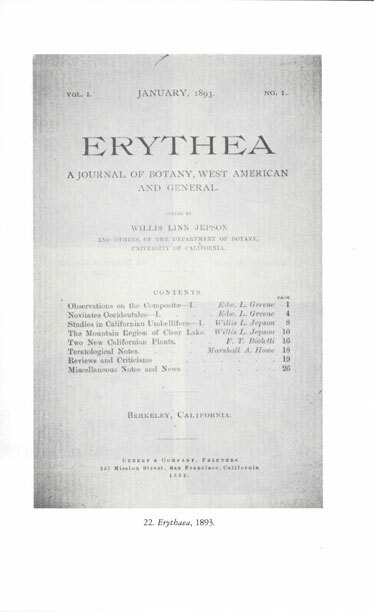 His thesis was entitled “Flora of Western Middle California,” forerunner of the famous 1925 Manual of the Flowering Plants of California and the incomplete Flora of California. Osterhout received his doctorate the following year and his assistant professorship in 1901. 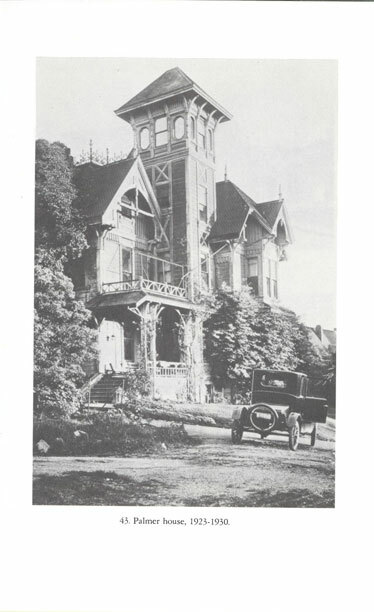 From its founding, the Department of Botany had occupied quarters in South Hall, one of the two original Berkeley academic buildings. In 1897, a two-story Botany Building was constructed on the north bank of Strawberry Creek for the Department’s exclusive use. In 1921 it was moved across the creek to a site near the present Hertz Hall to make way for the erection of Stephens Union. Osterhout left in 1909 to accept a position at Harvard and to go on to a distinguished career in plant physiology at both Harvard and the Rockefeller Institute. His departure forced the Department to devise various makeshifts for teaching plant physiology at Berkeley; later it was also taught in the College of Agriculture. A lecture and laboratory course in general botany was developed in 1912-13 by Assistant Professor Nathaniel L. Gardner, who had taken a local Ph.D. in 1906 after becoming associated with Setchell in the study of marine algae, and Thomas Harper Goodspeed, who was appointed instructor after concluding undergraduate work at Brown University and gaining a Berkeley doctorate. However, departments in the College of Agriculture were not happy with the style of presentation in the new course, and they established a special one-semester course for their own students in 1919-20. Satisfaction was restored with the course after Richard M. Holman was appointed as assistant professor the next year, and the special offering was dropped. Holman was a California- and German-trained plant physiologist and an experienced teacher. Important byproducts of this beginning course were the influential Textbook of General Botany by Holman and W. W. Robbins and, somewhat later, the Laboratory Manual by Bonar, Holman, and associate Lucile Roush. So anxious were publishers to secure a “modern” text that royalties on the textbook were bid up to an unprecedented level. Miss Roush deserves much credit not only for preparation of the manual but also for her gracious handling of the teaching assistants, who in those days each manned twelve hours of laboratory per week. A course in plant physiology, Botany 7, was instituted in Fall 1922. Gardner took over the teaching of Setchell’s cryptogamic botany and served as Curator of the Herbarium until 1934. When Elmer D. Merrill was Dean of Agriculture in 1924-29, his wide contacts in the Pacific Basin and East Asia enriched the Herbarium by a tremendous influx of specimens from these regions. Merrill reputedly spent much of his time working on these collections and he induced several of his former associates from the Manila Bureau of Science, particularly the pteridologist Edwin B. Copeland, to form more or less lasting associations with the Herbarium. Lee Bonar, trained at the University of Michigan, was appointed Instructor for 1922-23, became associated with Holman in teaching plant physiology and general botany, and developed instruction in various phases of mycology (especially forest fungi) as this area was gradually relinquished by Setchell. The latter, having abundantly demonstrated his capacity to teach everything offered by the Department gave up his suspiciously popular one-semester lecture course, Fundamentals of Botany, which had attained an enrollment of approximately 1,000 by 1922 and was on every football player’s program, and contented himself with his two memorable courses in history of botany and plant distribution, respectively. The College of Letters and Science was created as a curricular unit in 1916-17 by the merger of the College of Social Sciences and the College of Natural Sciences. 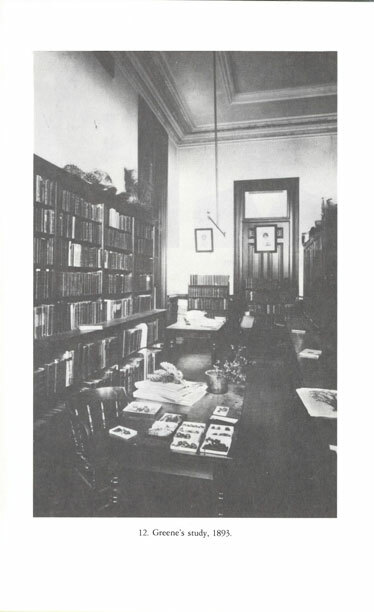 The Department of Botany was, of course, a founding department, and one that has subsequently contributed a disproportionate share of the leadership of the College. In the early 1920’s laboratory work began to be emphasized in general courses. This coincided with the loss to the Department of the Chemistry Annex that had for several years provided space for class laboratories, storerooms, and research for staff and graduate students. New space now had to be found and, after various expedients, the Department was able to take over the Palmer House, a remodeled residence that had been moved from the site of Memorial Stadium to that now occupied by Cowell Hospital. 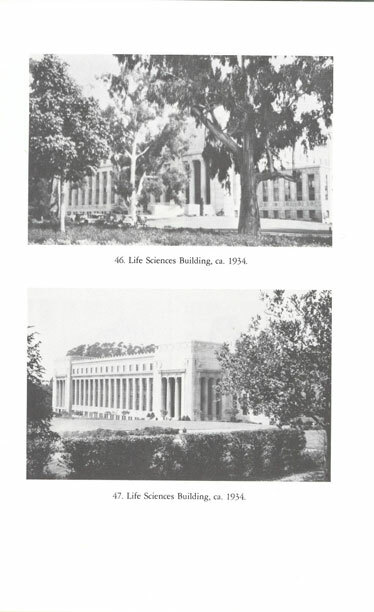 It provided laboratories for teaching general botany and forest fungi and some office and research facilities until the Department moved to the Life Sciences Building in 1930. 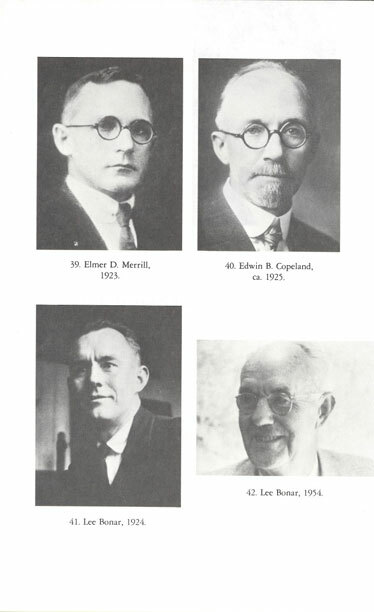 Herbert L. Mason, who had served as associate from 1925 to 1931, taking over more or less informally much of the responsibility for systematics in view of Jepson’s declining health, was appointed instructor in 1931. The following year he married Lucile Roush and also was awarded the Ph.D. for a study concerned with the paleobotany of conifers. He assumed control of the Herbarium in 1934 and served as its very able Director from 1938 to 1963, a period of rapid growth. 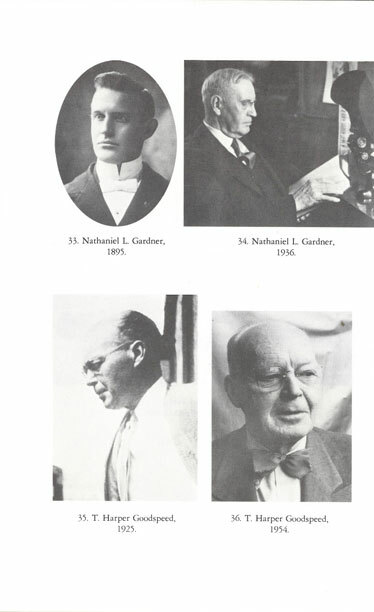 With the retirement of Setchell and Gardner in 1934, the death of Holman in 1935, and the retirement of Jepson in 1937, an important era in the history of the Department of Botany came to a close. The Setchell-Jepson era had seen the Department achieve national and international distinction, but the Department was unhappily polarized between these two strong but very different personalities and their adherents. The University Administration evidently thought this a propitious time for a thorough review, and the inevitable confidential committee was appointed and recommended a fundamental reorganization. In essence, the committee advocated (1) an amalgamation with the Division of Plant Nutrition of the College of Agriculture, (2) the naming of an “outside” chairman, and (3) active participation in the instructional program by plant scientists from Agriculture. These moves were interpreted by some as the final triumph of the College of Agriculture in its effort to win control over Botany. Goodspeed, who might have been expected to be the next chairman, was consoled with the directorship of the Botanical Garden. Here he built up an effective research group, which included at one time or another Priscilla Avery, Muriel Bradley, Mildred C. Thompson, and Helen Mar Wheeler, among others, devoted to studying the cytology and genetics of Nicotiana. He also launched the successful Botanical Garden expeditions to the Andes, from which the Herbarium as well as the Garden profited. 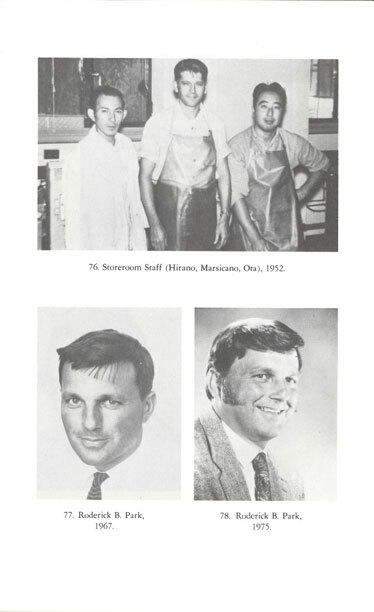 During this same period, Marion Stilwell Cave was appointed a research associate and began her productive studies in embryology and cytology, which have continued to the present time. Dennis R. Hoagland, the distinguished student of plant nutrition, served as chairman for two years, to be replaced by Alva R. Davis. The first appointment under the new regime was that of Adriance S. Foster, a Cornell- and Bussey Institute-trained plant morphologist, who came in 1934. 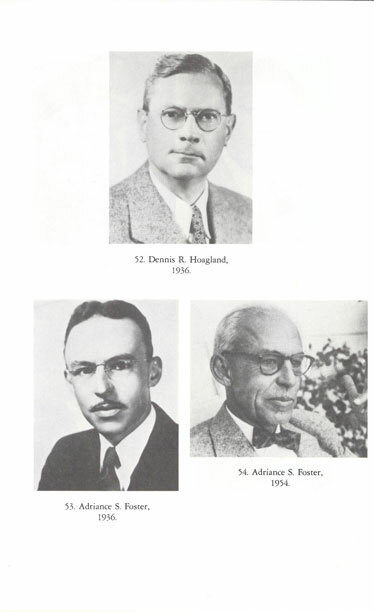 Professors Davis, Hoagland, Charles B. Lipman, Howard S. Reed, and James P. Bennett, all from Plant Nutrition, and James T. Barrett from Plant Pathology participated in the instructional program, but only Davis became a full-time member of the Department of Botany and, indeed, served as the principal architect of its new phase. By 1940 few traces of the amalgamation with Agriculture were still evident, although Lipman and Reed each continued to teach a course. “Sailor” Davis, who had been a merchant seaman in his youth, was trained at Washington University and became an early associate of Hoagland’s group. He was active in the Academic Senate’s agencies of self-government and demonstrated remarkable coolness and wisdom, administrative talents unlikely to be overlooked for long. One of his devices for welding together a harmonious department was the daily 4 P.M. coffee hour in the chairman’s office, which effectively disposed of any necessary “business” and initiated the younger staff members into the complexities of the University, and which was enhanced by the talents of a good-humored and accomplished raconteur. Lincoln Constance, one of Jepson’s last students, was added to the faculty in 1937, and Ralph Emerson, a Harvard-trained experimental mycologist, in 1940. The three newest appointees were initially involved heavily in one or another of the beginning courses, usually in company with a senior staff member, but they were also allowed to develop their own special areas of interest and to attract graduate students. After the outbreak of World War II, Davis was recalled to active duty as commander of an artillery school in southern California, Goodspeed was sent to South America by the State Department, Constance went to Washington to work for the Office of Strategic Services, and Emerson first taught physics and then became an important participant in the Guayule Project of the U.S. Department of Agriculture in Salinas. Bonar became acting chairman and Reed taught plant physiology to the few students who remained. Much of the Department’s physical space was taken over by war-related statistical activities. The sole staff addition was Assistant Professor George F. Papenfuss, a Johns Hopkins- and Swedish-trained South African, who vigorously reactivated teaching and research in phycology. The staff members who had been on war leave returned during 1945, and there was extensive reorganization of course offerings, marked by increasing emancipation from the role of service department to Agriculture. The rapidly expanding enrollments that now affected the entire University made possible several new appointments. 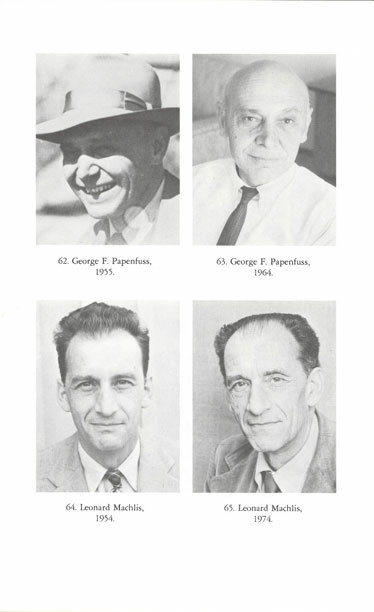 Leonard Machlis, who had taken his degree with Hoagland’s group, Johannes Proskauer, with a University of London doctorate, and John G. Torrey, a Harvard Ph.D., all joined the Department between 1946 and 1949. Old research fields were rejuvenated and active new ones were developed as the wave of student applicants rose even higher. 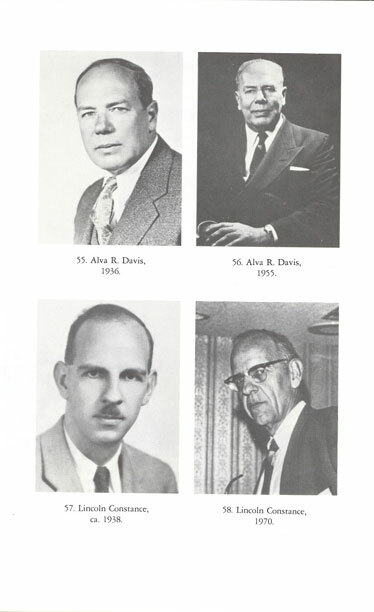 Davis was appointed the first budgetary dean of the College of Letters and Science by President Sproul in 1947, and the Department unhesitatingly turned to Bonar to serve as chairman, which he did for the next seven years. One of the earliest problems to confront Bonar was the disposition of the Jepson Herbarium and Library, which had been willed to the University with stipulations. Although Jepson died in 1946, his estate was not settled until 1949. A year later Rimo Bacigalupi, a graduate of Stanford and a Harvard Ph.D., was named Curator to preside over the Jepson collection. 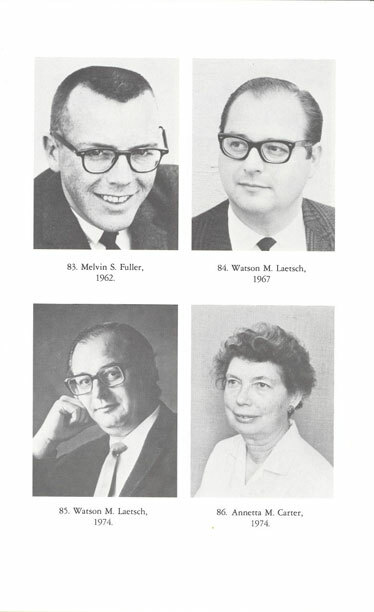 “Bach” brought in Lawrence R. Heckard, a graduate of the Department and then teaching at Urbana, to assist him in 1960. At the same time Papenfuss recalled his former student, Paul C. Silva, who was also teaching at the University of Illinois, to become his assistant in the Herbarium. 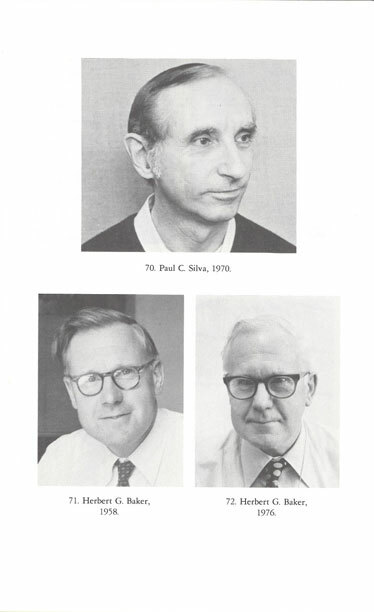 The Department voted in 1967 to put the key Herbarium positions in the professional research botanist series, a classification that was accorded to Silva and Heckard, and later to John Strother and Alan R. Smith, when they were appointed. Heckard succeeded Bacigalupi as Curator of the Jepson Herbarium and Library upon the latter’s retirement in 1968. Constance followed in Davis’ footsteps as chairman of the Senate Budget Committee. He had acquired Goodspeed’s interest in Latin America and returned from a Chilean sabbatical to serve as chairman of the Department for the single year 1954-55. His most notable achievement was to assure that the Botanical Garden, which was about to be set adrift by Goodspeed’s impending retirement, revert to the Department. At about the same time, Emerson created a “Microgarden” for “lower plants,” which was subsequently assiduously cared for by Robert Berman. With the explosive increase in enrollment in the late 1940’s and early 1950’s, the whole character of the University of California underwent rapid and profound changes. Earlier in the century capacity had been increased quickly by converting existing teacher-training institutions into branches of the University, beginning with the Los Angeles Normal School in 1919, which ten years later had become a full campus as UCLA. Santa Barbara joined the University family by the same route in 1944, but shortly thereafter legislative action put an end to such conversions. What had before World War II been to most Berkeleyans a single-campus (i.e., Berkeley) institution with a Southern Branch at Los Angeles and a few outlying establishments—Scripps Institution of Oceanography at La Jolla, Citrus Experiment Station at Riverside, Lick Observatory, the San Francisco Medical Center, and the Davis “farm”—was now suddenly rocketed to “multiversity” status as several of these locations acquired full campus status. Clark Kerr took office as the first Chancellor of the Berkeley Campus in 1952. 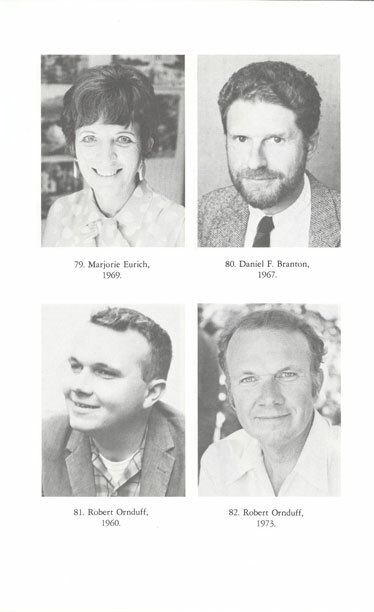 When Davis retired three years later, he became for one year the first Berkeley Vice Chancellor, and Constance was named to succeed him as Dean of Letters and Science. Davis had transformed the College into a significant budgetary unit, embracing more than half the campus. One of his final acts as Dean was to ask that a faculty committee undertake the task of defining the objectives of the College and re-examining its programs and requirements with regard to these objectives. Armed with a series of explicit directives, which Emerson had played a major role in preparing, Constance as the new Dean was able to carry out a series of sweeping academic reforms in his seven-year tenure. In 1957-58, Emerson and Richard Eakin of Zoology initiated the interdepartmental elementary course, Biology 11, forerunner of many successful joint efforts in the field of biology. At the departmental level, Foster (with initial assistance from Bonar) took over the chairmanship and served for five and one-half busy years. In 1958-57 Herbert G. Baker, a University of Leeds-trained “genecologist” (or “evolutionary ecologist,” as he later preferred to be called so as not to be mistaken for a gynecologist), gave up a chair in newly liberated Ghana to assume directorship of the Botanical Garden. Under the day-to-day management of Anton Christ, the Garden had played an increasingly important role as provider of research and class materials. Since Goodspeed had covered plant cytology as well as the Garden, the Department was allowed to add to its roster William A. Jensen, the first University of Chicago-trained staff member. His expressed enthusiasm for undergraduate teaching was a strong factor in his selection. Torrey returned permanently to Harvard in 1960. Philip J. Snider, also Harvard-trained, came to share the burgeoning load in mycology, but left again in 1963. Robert E. Cleland, a biochemist from Cal Tech, took over Torrey’s teaching for a few years, but in 1964 accepted an appointment at the University of Washington. During the first half of the 1960’s, under Machlis’ chairmanship, the Department enjoyed its greatest flush of growth. The new chairman exhibited an unparalleled ability to obtain the appointment and rapid promotion of able faculty members and to secure internal and external funds for rehabilitation of laboratories and other facilities that badly needed renovation after several decades of use. A well-organized and well-staffed storeroom, supervised by Robert Marsicano, was another of his successes. He also brought in Marge Eurich as departmental secretary. Machlis gave leadership to the Biology Council, most successful of the several area councils established at about that time to cope with matters of interdepartmental concern. The Council launched Biology 1 in 1963. 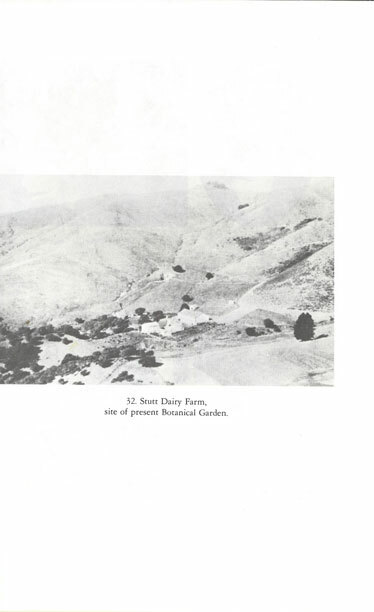 Both the Sagehen Creek Field Station in the Sierra Nevada and the Bodega Marine Laboratory, the latter owing much to Papenfuss’ and Emerson’s unremitting efforts, were brought into the orbit of the Department’s instructional program. A Chancellor’s committee charged with locating promising potential staff members in the area of molecular biology produced the name of Roderic B. Park, a graduate of Harvard and Cal Tech. With three departments bidding for him, the Department of Botany was immensely gratified that he chose to associate himself with it. 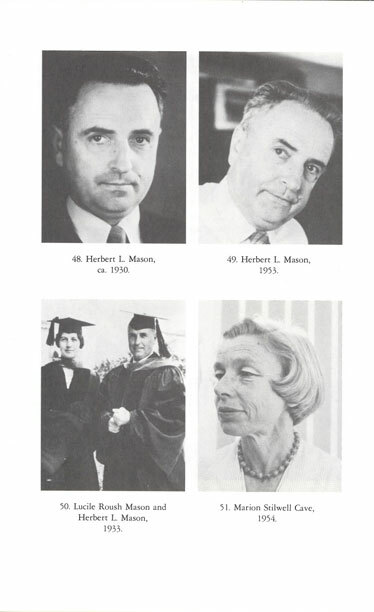 Between 1963 and 1966, six additional faculty members were appointed. 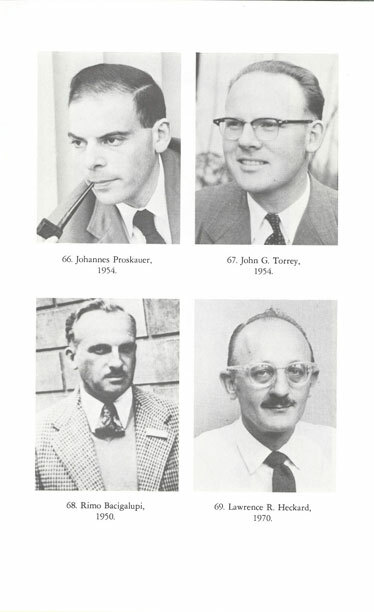 Daniel Branton, a specialist on cell membranes, Robert Ornduff, a biosystematist, and Melvin S. Fuller, a mycologist, had all done their doctoral work at Berkeley but had had significant teaching or post-doctoral experience at other institutions. 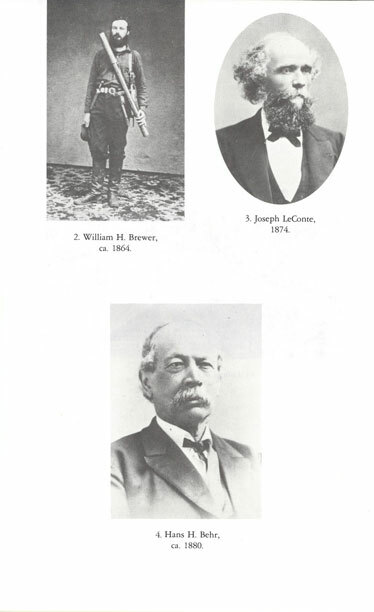 Watson “Mac” Laetsch, Stanford-trained, and Russell L. Jones, from Aberystwyth and Michigan State, shared an interest in growth and development. John A. West, whose interests fitted particularly well with the availability of the Bodega station, had obtained his training in marine phycology at the University of Washington from one of Papenfuss’ former students. The mid-1960’s were not only a time of rapid growth, but also one of increasing student and faculty disaffection, culminating in the so-called Free Speech Movement. Constance, who served as Vice-Chancellor at Berkeley from 1962 to 1965, was happy to return, somewhat battle-scarred, to being “just a professor” and Director of the Herbarium. The staff of the latter boasted many extraordinarily devoted persons over the years (Harriet Walker, Ethel Crum, Floy Bracelin, Vera Miller, Helen Sharsmith, Isabelle Tavares), but none who so strongly left her own cachet of friendly hospitality as Annetta Carter, who assisted Constance as she had Mason for many years, but voluntarily retired in 1968 to devote herself to the study of her Baja California collections. Alice Q. Howard stepped in to rescue the management from potential disaster. 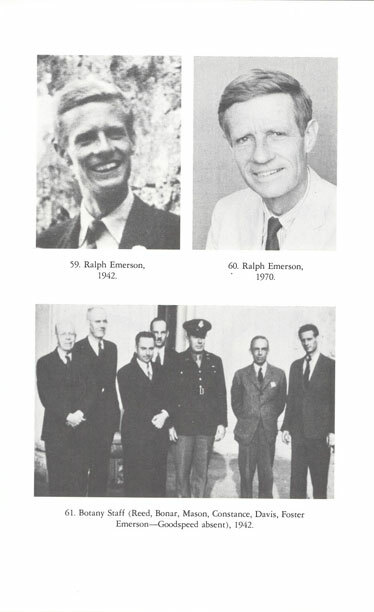 In the Department, Emerson, who was acting head during the disorders of 1964-65, survived to serve as chairman in his own right from 1967 to 1971. Although departmental glass doors and windows were smashed with sickening regularity, the Department suffered no internal violence and little internal division. This can perhaps be explained by the fact that staff members took their teaching duties seriously, or simply that there was a small number of botany students. 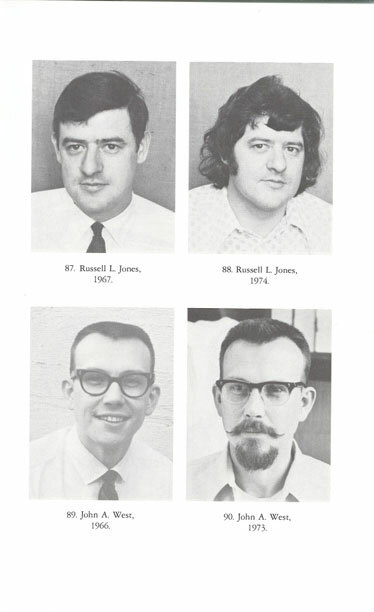 As a consequence of these happenings of the mid-1960’s, graduate students were encouraged to organize themselves and to supply representatives to participate in faculty meetings. This development was greeted at first with apprehension by some faculty, but it soon proved to be not at all horrendous but actually quite constructive. The departmental faculty, particularly the more senior ones, had begun to reap a gratifying crop of kudos: election to office in national professional societies, membership in learned academies, Guggenheim and Miller fellowships, and awards of various kinds. Emerson, in 1971, became the first member of the Department since Setchell (not counting Hoagland) to be taken into the National Academy of Sciences. It was at about this time that the Department received the heartening word that Cartter’s survey (1966) of graduate departments for the American Council on Education had ranked it the leading botany department in the nation, with Harvard placed second. The fact that Harvard had no botany department did little to dampen the euphoria. This accolade was reinforced by another number one rating by Roose and Andersen’s survey in 1970, also for the Council. Perhaps it was even more important that the younger members of the staff, especially, demonstrated a great ability to attract sizable research grants. Much to the dismay of most members of the Department, the University changed from the semester system to a quarter system in 1966, necessitating reorganization of courses, straining availability of laboratory materials, and forcing other painful adjustments. It did permit introduction of an integrated biology course—Biology 1A-B-C—which had long been an objective of the Biology Council, and in which Botany staff became heavily involved. Two years later an ecology course, Biology 150, was added. 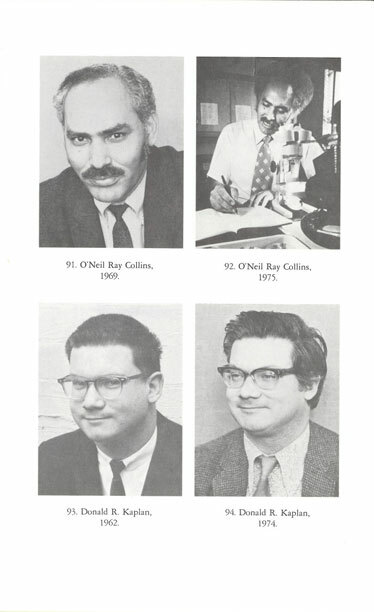 When Fuller left in 1968 to head the Botany Department of the University of Georgia, O’Neil Ray Collins, a student of slime molds, trained at the University of Iowa, became the first black faculty member in the Department. Baker, tired of directing the Botanical Garden after more than a decade, and Laetsch, who replaced him, both very significantly expanded the Garden’s instructional role. Donald R. Kaplan was enticed back from the Irvine campus to replace his major professor, Foster, who retired in 1970. Kaplan immediately set about putting his own distinctive stamp on plant morphology, which Foster had taught meticulously for many years as Botany 16 in the fall and Botany 105 in the spring. With Proskauer’s tragic early death in 1970, the Department sought to shore up its strength in the area of structural botany by appointing Rudolf Schmid, who had obtained his doctorate at the University of Michigan. Toward the beginning of the 1970’s, the vocal but mercurial student movement suddenly discovered The Ecology and The Environment. Whatever was meant by these terms, the Department was overwhelmed by young people passionately interested in drug plants, edible native plants, organically grown vegetables, biological symbiosis, and the like. Much of this tide of increased enrollment affected Baker most directly, but it also had a spectacular effect on the California flora course, taught alternately by Ornduff and Constance. Jensen succeeded Emerson as chairman in 1971. Soon he could point to the retirement of Papenfuss in 1971 and the defection of Branton to Harvard in 1973 as strong argument for providing the Department with more manpower, which was particularly needed in the area of plant ecology. However, an always unpredictable Department instead selected as an ecologist Nancy Vivrette, who was trained at the Santa Barbara campus, as the first woman to become a regular faculty member in the 83-year history of the Department. In 1972, history seemed to repeat itself, when Park was appointed Provost and Dean of the College of Letters and Science. His situation differed from that which had once faced Davis and Constance in that he had the assistance of four divisional deans and that he also had responsibility for the Ethnic Studies programs that were a specific result of the Third World Strike of a few years earlier. Collins was quickly “borrowed” by the Dean of the Graduate Division to serve as his associate dean in the area of minority programs and problems. Ornduff took over directorship of the Botanical Garden from Laetsch, who found that responsibility for the Lawrence Hall of Science, a University-sponsored facility to promote public education in science, was sufficiently time-consuming. Attracted by the opportunity to serve as Program Director for Developmental Biology for the National Science Foundation, Jensen departed for Washington in August 1973, leaving Machlis as acting chairman to work his old magic in a drastically changed budgetary climate. 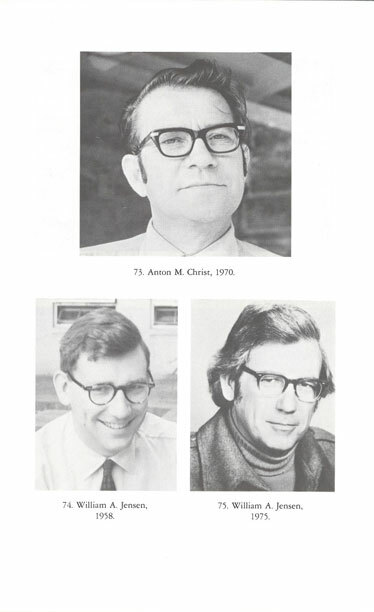 When Jensen took up the challenging invitation to return to the campus as chairman of the Department of Instruction in Biology (DIB) for 1974-75, Machlis was confirmed in a new administrative tour of duty at the departmental level. The recycled chairman foresaw his most pressing task to be that of reorganizing the Department’s supporting staff and placing the reins of management in the hands of a capable (if not super-human) laboratory business officer; the latter objective was achieved in the appointment of Mitsuru “Mitch” Ikuta. A long and careful search for a cell physiologist to replace Branton culminated in 1975 with the appointment of W. Zacheus “Zac” Cande, who capped a Stanford Ph.D. with two-and-a-half years at Boulder, harassing and manipulating the otherwise smoothly proceeding process of cell division. 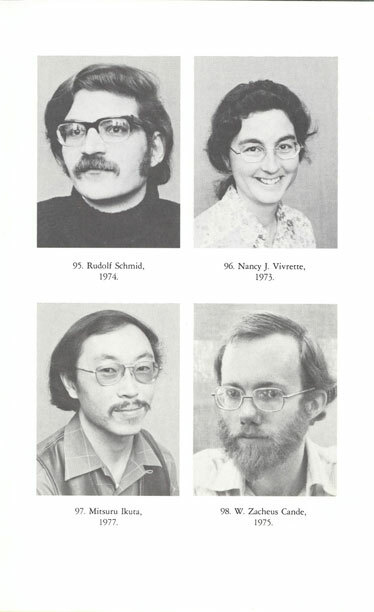 The year of 1975-76 was expected to see the retirement of both Constance (mandatory) and Machlis (voluntary, for reasons of health), who had been associated in one way or another for four decades, with the hope that both would be replaced by young scholars eager to extend the high reputation of the Department into the final quarter of the twentieth century, and well past its centennial year of 1985! Departmental affairs, like human ones, rarely work out exactly as anticipated. Machlis died suddenly and tragically in April 1976. Collins replaced him first as acting and then as regularly appointed chairman. Emerson was chosen as one of the two Faculty Research Lecturers for 1976-77, and made his usual excellent presentation. Thomas Duncan, upon completing his doctorate at Ann Arbor, joined the Department in 1976, bringing an interest in the systematics of buttercups and the capacity to study them by the application of computers. Bonar died in the summer of 1977, at the ripe age of eighty-five. With Ornduff on subbatical leave, Constance looked after the two herbaria and the Botanical Garden for the academic year 1977-78. Jensen was chosen president of the Botanical Society of America for 1978, the fourth member [after Foster (1954), Emerson (1967), and Constance (1970)] of the Department to hold that office. [Added in proofs, June 1978: Herbert Baker has just been elected to head the Botanical Society of America!] 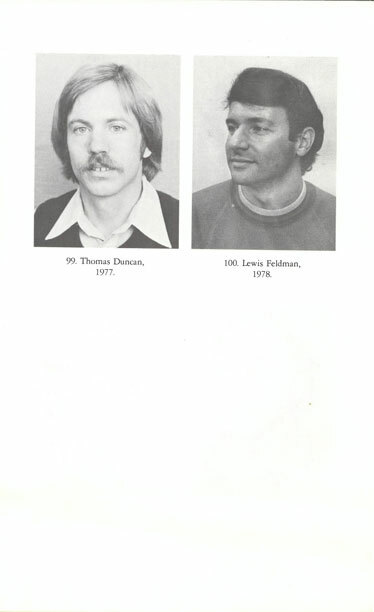 Lewis Feldman, a native of Hayward only thinly disguised as a student of Torrey’s at Harvard and for the past two years a Miller Fellow, joined the Department on July 1, 1978, as plant physiologist, thus successfully ending a long search. 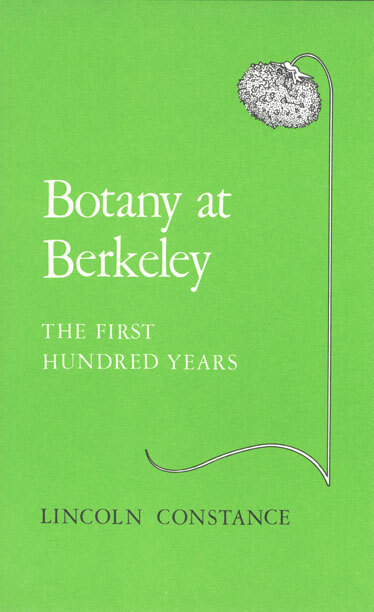 *During the 1950’s the Ph.D. in Botany was administered by a Graduate Group that included representatives of Plant Sciences (College of Agriculture) on both the Davis and Berkeley campuses and Forestry at Berkeley as well as the Berkeley Department of Botany staff. Some individuals included on this list were actually housed in other departments; those who did their work at Davis are intentionally excluded. Some graduate students who worked in the Department at Berkeley took their degrees in other Groups (e.g., Genetics, Microbiology. Plant Physiology); these are included insofar as possible. The assistance of Professor Louis Jacobson, Professor of Plant Physiology in the Department of Soils and Plant Nutrition, is gratefully acknowledged. The following photographs are reproduced through the courtesy of The Bancroft Library, University of California, Berkeley: 1, 3, 6, 7, 9, 25, 30, 43, 52, 53, and 55. Photograph number 14 is reproduced through the courtesy of the Hunt Institute of Botanical Documentation, Carnegie-Mellon, University of Pittsburgh, Pennsylvania. Photograph number 32 is by Lewis Stein, Jr.
1. College of California, 1869. 2. William H. Brewer, ca. 1864. 4. Hans H. Behr, ca. 1880. 6. 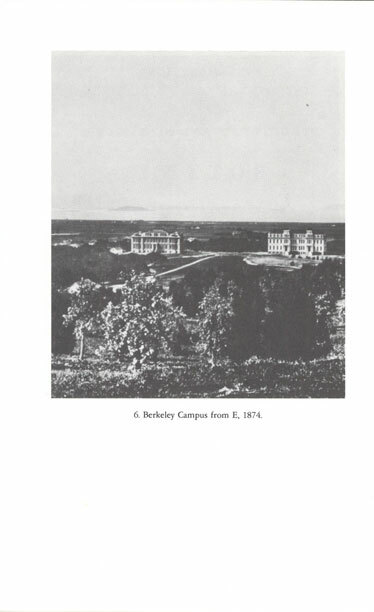 Berkeley Campus from E, 1874. 7. Eugene W. Hilgard, 1874. 8. Charles E. Bessey, 1875. 9. Greenhouses on Campus, 1875. 10. 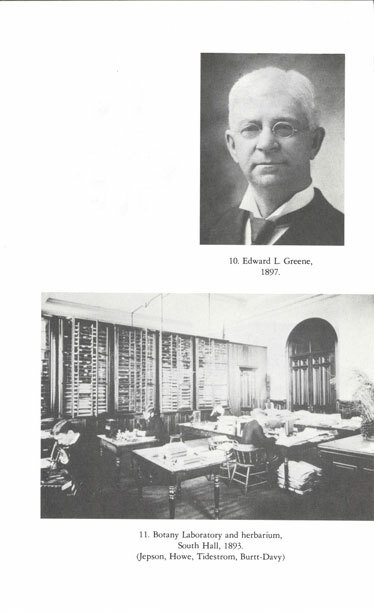 Edward L. Greene, 1897. 14. Ivar Tidestrom, ca. 1925. 15. Willis L. Jepson, 1896. 16. Willis L. Jepson, 1928. 17. Marshall A. Howe, 1896. 18. 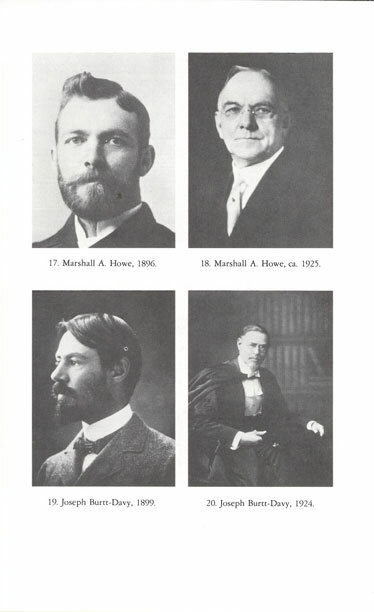 Marshall A. Howe, ca. 1925. 21. San Francisco Call, 21 July 1895. 23. William A. Setchell, 1895. 24. William A. Setchell, 1934. 25. W. J. V. Osterhout, ca. 1900. 26. Botany Building, ca. 1898. 27. Harvey M. Hall, 1901. 28. 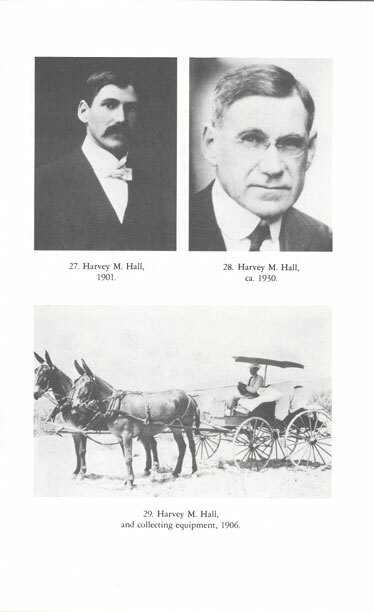 Harvey M. Hall, ca. 1930. 29. Harvey M. Hall, and collecting equipment, 1906. 33. Nathaniel L. Gardner, 1895. 34. Nathaniel L. Gardner, 1936. 35. T. Harper Goodspeed, 1925. 36. T. Harper Goodspeed, 1954. 37. Richard M. Holman, 1923. 38. 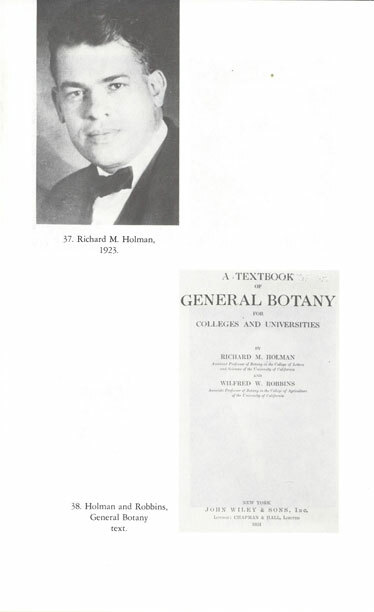 Holman and Robbins, General Botany text. 39. Elmer D. Merrill, 1923. 40. Edwin B. Copeland, ca. 1925. 44. Chemistry Annex, ca. 1925. 45. Hearst Mining Building, ca. 1934. 46. Life Sciences Building, ca. 1934. 47. Life Sciences Building, ca. 1934. 48. Herbert L. Mason, ca. 1930. 49. Herbert L. Mason, 1953. 50. Lucile Roush Mason and Herbert L. Mason, 1933. 51. Marion Stilwell Cave, 1954. 52. Dennis R. Hoagland, 1936. 53. Adriance S. Foster, 1936. 54. Adriance S. Foster, 1954. 55. Alva R. Davis, 1936. 56. Alva R. Davis, 1955. 57. Lincoln Constance, ca. 1938. 61. Botany Staff (Reed, Bonar, Mason, Constance, Davis, Foster, Emerson — Goodspeed absent), 1942. 62. George F. Papenfuss, 1955. 63. George F. Papenfuss, 1964. 67. John G. Torrey, 1954. 69. Lawrence R. Heckard, 1970. 70. Paul C. Silva, 1970. 71. Herbert G. Baker, 1958. 72. Herbert G. Baker, 1976. 73. Anton M. Christ, 1970. 74. William A. Jensen, 1958. 75. William A. Jensen, 1975. 76. Storeroom Staff (Hiram, Marsicano, Ota), 1952. 77. Roderick B. Park, 1967. 78. Roderick B. Park, 1975. 80. Daniel F. Branton, 1967. 83. Melvin S. Fuller, 1962. 84. Watson M. Laetsch, 1967. 85. Watson M. Laetsch, 1974. 86. Annetta M. Carter, 1974. 87. Russell L. Jones, 1967. 88. Russell L. Jones, 1974. 89. John A. West, 1966. 90. John A. West, 1973. 91. O’Neil Ray Collins, 1969. 92. O’Neil Ray Collins, 1975. 93. Donald R. Kaplan, 1962. 94. Donald R. Kaplan, 1974. 96. Nancy J. Vivrette, 1973. 98. W. Zacheus Cande, 1975.